Bottomfeeder honored in Canada, Australia and the United States! "An important reminder that we will have to take better care of our oceans if we want seafood in our future." "Bottomfeeder will become one of the most important books of this decade. 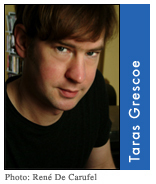 Like Michael Pollan, Taras Grescoe is very brave. He tackles the status quo and dives directly into the horrors of overfishing and the destructive practice of dining at the top of the watery food chain. Is there a solution? Yes! And, with this monumental book, he points the way." "One of the best accounts of the global crisis of fisheries, and of its implications for the seafood supply to changing markets. Whether we like it or not, most of us will become what its title says we will." "You'll be stunned by what Taras Grescoe reveals behind the scenes about your dinner, but also delighted by the way he rethinks our relationship with fish." "A bold and important book. Bottomfeeder does for the seafood industry what Fast Food Nation did for burgers and fries." "A harrowing account of the apocalypse unfolding in our oceans. But Grescoe comes with a message that anyone who cares about food can rejoice in hearing: eating near the bottom of the food chain may restrict your menu, but it'll open up your world." "What Grescoe proposes is nothing less than a rethinking of our relationship to seafood, from the 'fork back to the hook,' and Bottomfeeder could do for sustainable seafood what Michael Pollan's The Omnivore's Dilemma has done for pasture-raised meat." Just when opting for omega-3-rich seafood is recognized as one of the healthiest dietary choices a person can make, the news seems to be full of stories about mercury-laden tuna, shrimp contaminated with antibiotics, and collapsing fish stocks. In a world of endangered cod, pirate-caught Chilean sea bass, and sea-lice-infested salmon, can we really continue to order the catch of the day in good conscience?